Who can resist the allure of ancient Egypt — and the thrill of exploring mysteries that lay hidden for thousands of years? 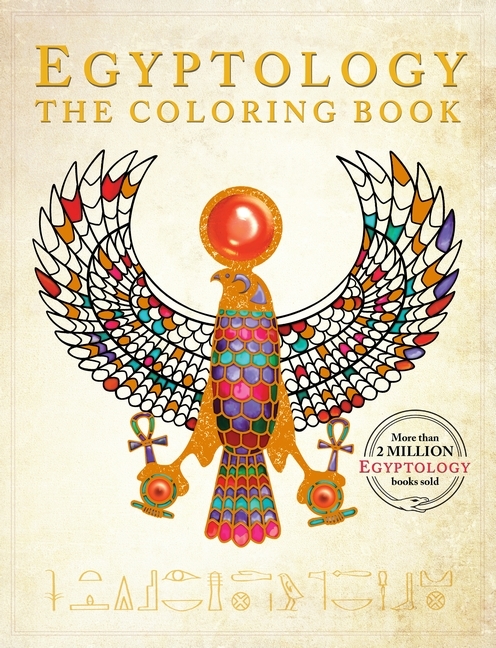 Now dedicated Egyptologists and avid coloring fans alike can put pencil or marker to the page and bring extraordinary treasures to life. The images found within include hieroglyphs, pyramids, artifacts, statuary, and mummy masks such as those discovered inside the tomb of King Tut himself. Art and history combine with this book based on the facsimile of a journal supposedly written in 1926 by Egyptologist Emily Sands. I find Egyptian history fascinating and enjoyed reading the interesting notes written within the pages. Emily, the Egyptologist, tells of discoveries and things she learned while exploring Egypt, including the fact that ancient Egyptians appeared to have no desire to travel to foreign parts. The left side of each page is the journal writings in typed form, with the date included. The right side of each page is illustrations that you can color, including hieroglyphics, artifacts, mummies, and more. I've used colored pencils to draw on the pages so far, so I can't vouch if markers will bleed through or not. Egyptology: The Coloring Book is still an interesting read, even if you don't want to color in it. One person will win Egyptology: The Coloring Book. I would go back to so many times... I think I would go back to 1968. "Leave a comment on this blog post: If you could go back in time, what era or period would you like to visit?" The 18th century, because men should always wear knee-britches and embroidered vests. I'd love to go back to the 1700s, just before the American Revolution. I've always wanted to go back to the 1950's and see if it's as fun and simple as I think it was. I would go back to when I found out I was pregnant, I would stop every med despite what the doctors said, and I'd spend every moment enjoying my baby and praying to God the changes would allow her to live. I would love to go back to the 40s! I'd go back to the mid 1600s in England. I would want to visit the 40s or 50s because first the fashion was awesome. Also because times was just simpler and less stressful. I would like to go back and check out the 20's! The 1920's sound like an interesting time. I would love to visit the Regency period in England. I would love to go back to the 60s. It seems like a much simpler time. It's so hard to pick just one time period. I would love to go see what the vikings were actually like. The 1920s have always been appealing to me. It would be fun to visit that time. I'd like to go back to the France of Louis XIV. I would like to go to the 60s. I'd like to go back to the 1930's or the 1940's. I would go back to the 1920s since I love their style and life seemed simpler then. I would like to go back to the '60's and '70's when life was so much more enjoyable, relaxing, and less hectic. I'd like to visit the late 1800s. I would go back to the early 1960s, loved that time of life. I would love to see the 60s. I would love to go back to the 50s! I love the English Regency period. I'd go back in time to right after I had my 3rd daughter and do things differently to make sure she never took her own life. i would like to go back to the bible times. I would love to go back to visit the Roman Gladiators. I would like to go back to victorian times. I'd like to go back to the 20s in the USA. I would go back to the mid 1800s in the U.S. I would go back the Elizabethan Time. I would say the Medieval time. I would love to go back to the 1880s. I'd love to go back and see Women's Baseball! I'd like to go back to the WWII era. I would not like to go back in time. I love to go visit little house on the prairie time.